Joey went to Brazil and brought me back a chocolate bar...plus a fascinating story about Terra Vista, an 800-acre sustainable chocolate farm in Bahia. 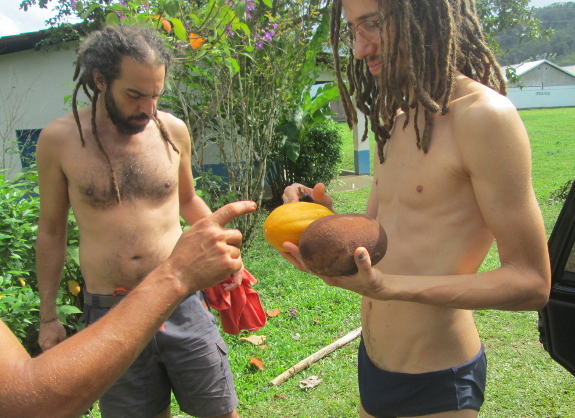 The photo above shows some of Joey's new Brazilian computer buddies, one of whom is holding a cocao pod (the brown one) along with a tropical fruit. The other photo is of my Brazilian chocolate bar, which is interestingly hard --- perhaps much lower in fats than the chocolate I'm used to? The ingredients list 50% cocoa, 6.6% cocoa butter, 36% sugar, 7% milk, and 0.4% soybean lectin. 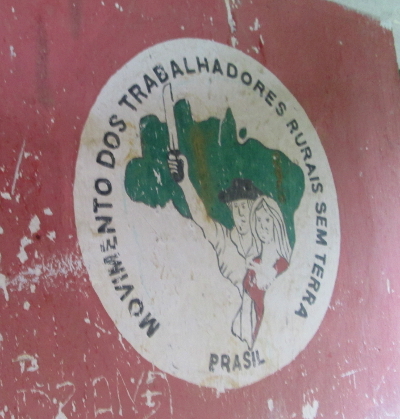 The story that goes along with the bar is about the Brazilian Landless Workers' Movement, an effort by the peasantry to regain control of agricultural areas in Brazil. According to the Movement, 3% of the Brazilian population owns 67% of the country's agricultural land. A new constitution drafted in 1988 can be interpreted to give Brazilians the right to occupy unused agricultural land, to return that land to productivity, and then, eventually, to gain ownership of the property. Using this method, 50 low-income families moved onto what is now Terra Vista in the 1990s, planted crops, and began to farm organically. The story made me wonder --- what would life be like in the U.S. if we had a similar law on the books? Would it be good, allowing lots of young people who dream of farming but don't have the capital to move back to the land? Or would it be bad, with wild areas currently being protected by neglect instead clearcut and turned into farmland? I'd be curious to hear your take in the comments section. On a less serious note, Joey said that what caught his eye in Terra Vista was the free-range chickens, all of which were skinnier than American birds. There were so many chickens that it seemed that each person on the farm ate one a day, mostly in the form of stew. I would love to send you to a website so you could learn more about Terra Vista, which Joey said was full of raised beds and other techniques he was familiar with from our own farm. But the whole point of Joey's trip was to connect villages who don't have internet access, allowing them to trade data using memory sticks carried by hand when people travel from place to place. So you'll have to use your imagination about everything Joey didn't happen to take photos of. I hope you enjoyed this brief glimpse of sustainable Brazilian agriculture! We have that Law on the Books in the US....although it's not Socialism/Communitarianism as with Brasil. This is a very old law. I would say that soon we will have all that here too. Here it's called Adverse Possession. It means you can occupy an abandoned or un-lived in property legally; each State has it's own limitations on the amount of years you must occupy until you can claim it as your own. In Kansas it's 15 but some States it is only seven. The Law is about using the land productively. Adverse means you must notify the owner that you have taken possession of the abandoned property but he has a choice to give you permission to stay or face the chance of loosing it to you.